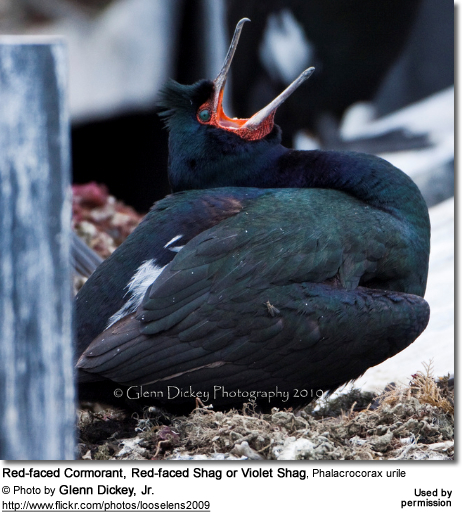 The Red-faced Cormorants (Phalacrocorax urile) - also known as Red-faced or Violet Shags - are large, dark waterbirds found in the far north of the Pacific Ocean and Bering Sea - from the eastern tip of Hokkaid? in Japan (via the Kuril Islands), the southern tip of the Kamchatka Peninsula and the Aleutian Islands to the Alaska Peninsula and Gulf of Alaska. The Red-faced Cormorants were named for their distinctive red faces. They are mostly sedentary (non-migratory), only dispersing over nearby coasts during the winter. They are most easily recognized by the way they perch with their wings spread to out to dry them after foraging in water. 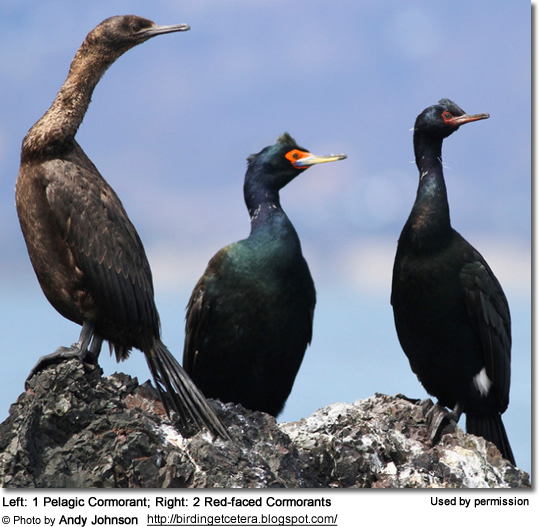 Their closest relatives are the Pelagic Cormorants (P. pelagicus); the ranges of these two species only overlap in Alaska. Adults have few predators, except for the occasional river otter. The eggs and the young are often taken by birds of prey (such as the Bald Eagles), Gulls and corvids. Adults weigh between 3.3 - 5.1 lbs (1.5 - 2.3 kg). Females are usually about 12.3 oz (350 g) lighter. Their dark, glossy plumage is mostly deep greenish blue in color, turning purplish or bronze on the back and sides. The bare facial skin is red - brighter in breeding birds and less vivid in non-breeding adults; distinguishing them from their relatives, the Pelagic Cormorants. Males and females look alike, except for the female being slightly smaller in size. Face is turning a bright orange or red. Forehead turns red. Very dark plumage, lack the distinctive red face of breeding adults. Loons lack the hooked bills of the Red-faced Cormorant. 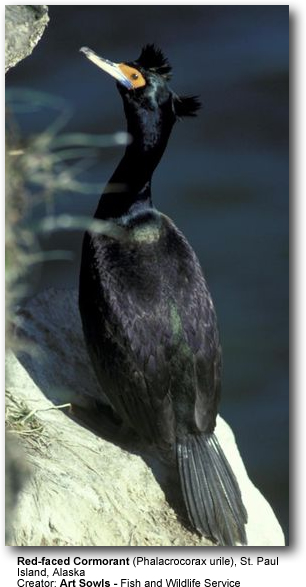 No other cormorant species has a small blue gular region with a bright red forehead. In the breeding season, the Red-faced Cormorant has a red forehead and a pale bill. Other cormorants lack the white flank patch. Red-faced Cormorants feed on various small fish (cottids), crabs and shrimps mostly caught by diving to depths of up to 100 feet (~30.5 meters) from the surface of the water and chasing prey under water. They generally grab fish in their bills, without spearing them. Red-faced Cormorants form breeding colonies along rocky coasts or on offshore islands - often alongside the Pelagic Cormorants. Their nests are typically situated on the ledges of cliffs. Nesting typically occurs in May or June.